Be Creative was the official conference art project of the Oklahoma Art Council's 2014 Oklahoma Arts Conference. During the event on October 22 & 23, Red Dot Sculpture and the Firehouse Art Center produced the project, using foil sculpting to actively engage attendees through direct creative participation in the event. Before and during the conference, attendees sculpted their own creations from a single sheet of foil and added them to an installation of artist-made foil sculptures. Attendees of the event were encouraged to make a sculpture out of foil and bring it to the conference on October 22 & 23 to add it to the Be Creative interactive installation. The final installation illustrated the power of individual creativity and how, through its unification, an innovative community can be built. For more information about the 2014 Oklahoma Arts Conference, please visit the Oklahoma Art Council's website. 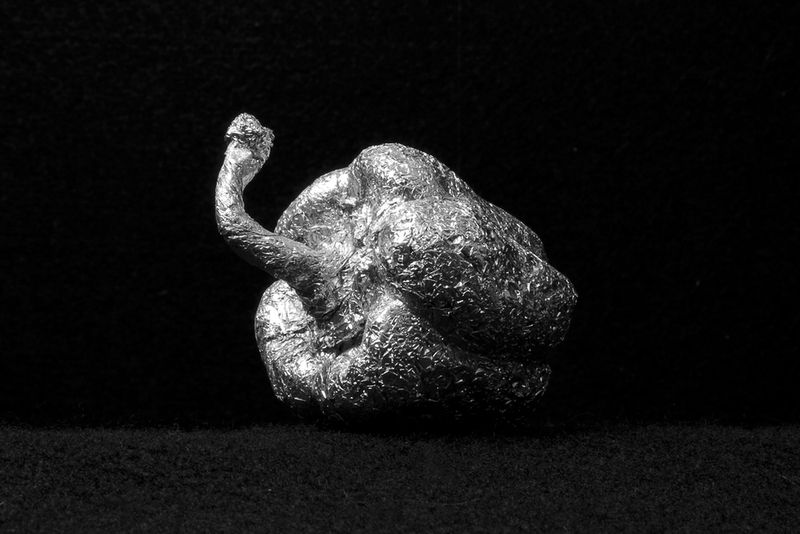 Use one single sheet of foil to sculpt whatever you can imagine. Bring the sculpture to the 2014 Oklahoma Arts Conference on October 22 & 23 to add it to the Firehouse Art Center's installation of other innovative creations. Try, try, try again. Get creative and have an open mind. A good apple can be transformed into a great pear. Don’t get discouraged! Sensitivity. Work your foil with a delicate touch. Foil tends to break down if it is overworked. Wait until your sculpture is almost complete to apply harder pressure and compression to your final creation. Crumple twist. Building mass with foil works best when you can successfully get the foil to interlock on itself. Take your time. Go slowly, working the whole sculpture to reduce the sheet into your final form. Four-legged creatures. Think of the shape of an animal hide; gently tear foil into an "animal hide" shape and begin turning the shape inward towards the body of the creature. Scrunch or fold. Scrunching works well for sculpting with foil, but folding techniques like origami and kirigami can also be used. Create, reflect, make adjustments. Foil sculpting can open the discovery of possibility by creating an atmosphere of exploration. Be prepared for the potential of success from misadventure. The following businesses and organizations supported the Be Creative project by hosting "Be Creative Stations" leading up to the conference. Each place contributed their own collections of foil sculptures created by staff and patrons to the final project installation.